For over 20 years Skipper have been producing beautiful hand-made wooden sailing boats, available in 8”, 10”, 12”, 15”. All yachts have genuine sail cloth, adjustable rigging, solid wood hull and steel keel. Skipper is proud to design toys which engage children in traditional play and fun. In a world of instant gratification, Skipper toys aim to develop patience, independence and learning whilst promoting the magic of social interaction between different generations. Also look out for Skipper's range of ride-on toys including a child’s first balance scooter and Ride n Roll. 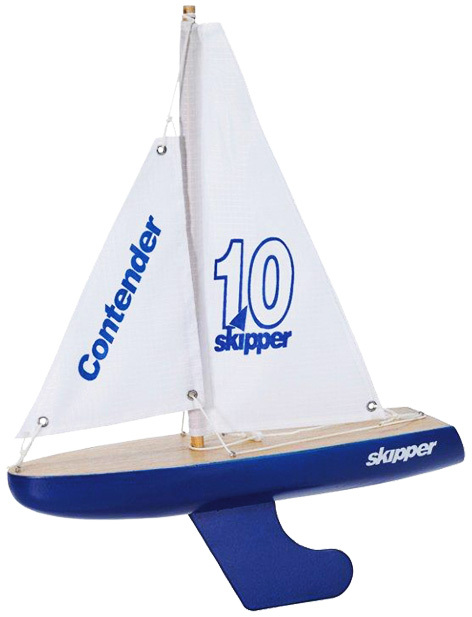 In keeping with tradition, all Skipper toys are hand-made using natural materials such as wood. Please tell us what you think of the Skipper Contender Traditional Yacht by Asobi.